John was tall, lanky and always dressed in baggy shorts with a t-shirt, often one he designed. Funny, biting wit, all delivered by a crisp South African cadence. He was an artist, a designer, a friend- and host to many people through out the world. He passed on early this month surrounded by a small circle of closest friends, succumbing to ALS, or amyotrophic lateral sclerosis, a progressive neurodegenerative disease. He would have hated any saccharine sentimentality and would not want anyone to dwell on that, so here I am, an ocean and continent away, celebrating the colorful character I remember fondly. John Bain was one of the first people I met during my initial adventure to Hawaii in the early 80’s. He had what seemed like the best “gig” I could imagine. 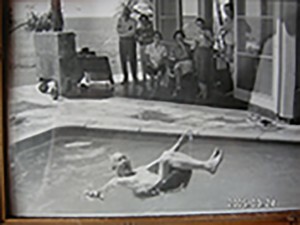 John was caretaker of A.L. 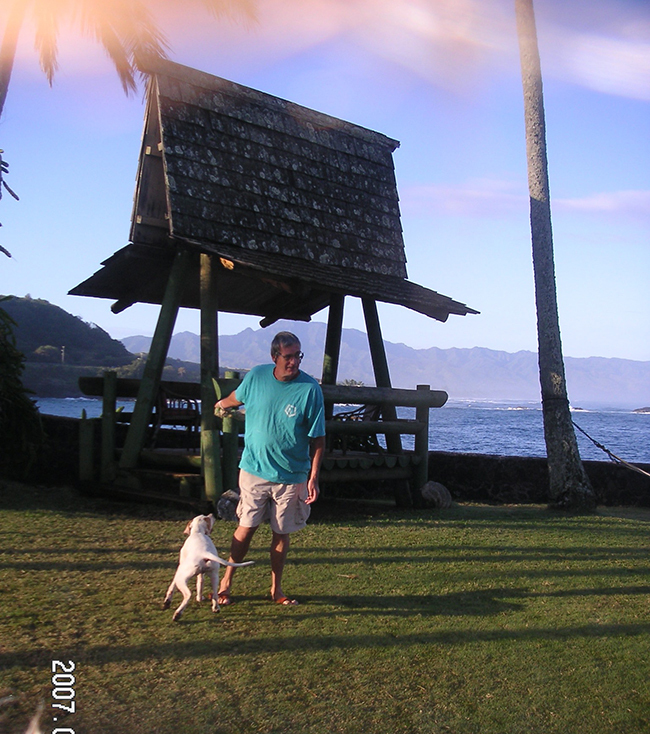 Kilgo‘s country home at beautiful Waimea Point, overlooking the bay on the North Shore of Oahu. He lived on the first of the three houses on the property and over saw the rental of the other two homes leading out to the point. There was always a cute surfer or two or three, or more, staying at John’s during the fall and winter surf season and John painted many of them. Here is John’s “private gallery” at the point house and through the doorway on the left you can see small framed photos from Kilgo’s party days out at the house. 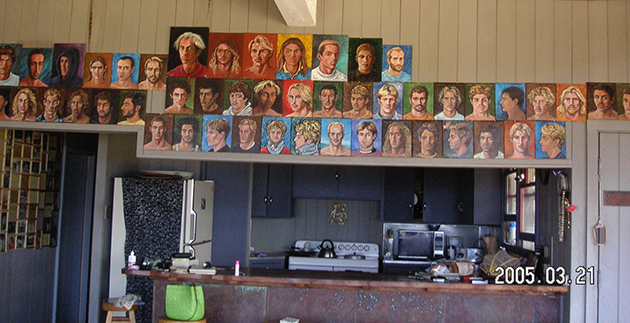 Surfer Portrait Wall by John Bain. 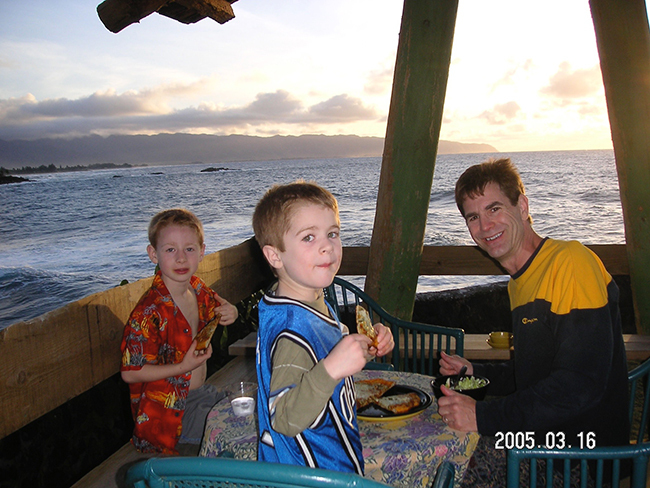 After I moved to the mainland and started our family with Scott, we had the opportunity to stay at the coveted house on Waimea Point more than once. 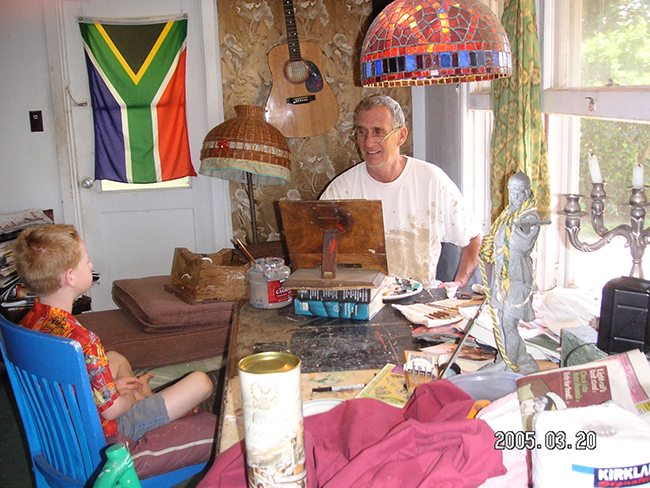 John was always painting, working or designing something, and his house was filled with his work and collections. During one of our visits staying at Waimea, we commissioned John to do a small portrait of each of our boys. 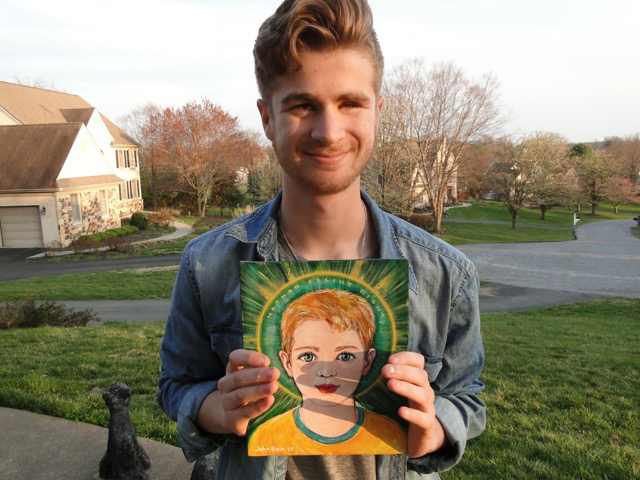 In my last email to John when I first learned about his illness I had Nate and Griffin pose with their portraits. 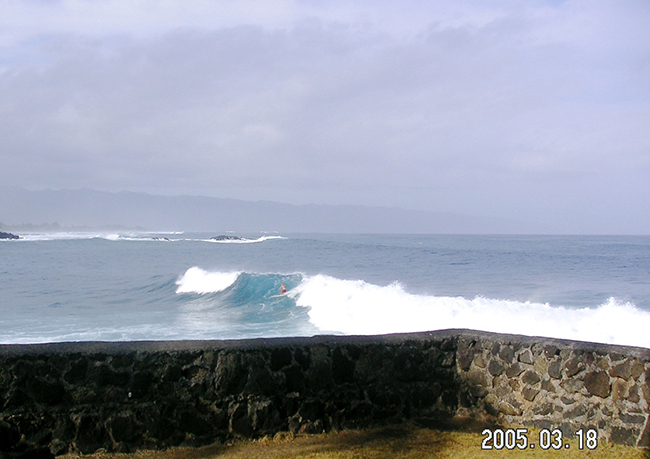 To John- with love and much aloha. and Cheers! 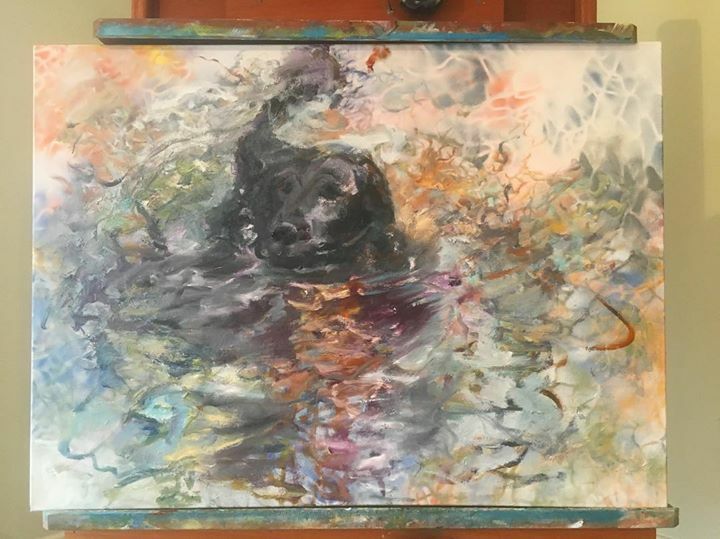 What a wonderful story of your friend….so glad you had the portrait with the boys. Life is happening all around us. Thank you Cathy, I thought of you when I heard about his passing, because he was such a good friend, as are YOU, and many of those friends were there for him in his time of need. As you do for so many. It’s all about LOVE. I have just learned of his death. I am very sad because it was a very generous man who hosted me the time to find a hotel, me French lost in hawaii in the early 90s. He had become my friend. Yes, John was that kind of guy- and because of that, and his quick wit, he had friends all over the world. Truly a loss. I was USN Submarine Secret Service, Sevron, Pearl Harbor Seventh Fleet 1967, and right around then I met John. I invited him and a couple of his friends on board the sub. John had long long red hair right down below the nape of his back, tall, thin full of energy, a girl friend of his at that time, Sally Roberts, and other acquaintances. His hair caused quite a stir on the sub,, and no one got at all upset with him, as he was able to respond to any comment with a lovely acrid, you are bleeding already from several different wounds, and don’t even know it. retort, I always liked him. He was an expert photographer and made a head sheet for me, which got me a funny little modeling job which I never got paid for in the end, cause, the producers of this advertisement, decided to keep just the girl they had, and deleted me, and did a remake with only her. I was so happy when I found that they made that decision. Maybe that’s the Johnny Bain, I knew who you laid to rest, or not, however his entire family originated in and around Cape Town, South Africa. Very well spoken with the Queens English, he was, and he mentioned his bloody school he had to go to, and you know. G-d, Save The Queen and all that. “Easy Rider ” Came out. I was still on active duty then, and I raised hell with the Navy with that car, cause as much as they wanted to blow it up with me in it, they didn’t and the Military Code of Conduct told them they had to let the car on the base provided the American Flag painted on the car, was an exact replica of the flag, and from the air, looking down upon it, it was the American Flag. I left the Island in November that very year, 1969, went to Aspen and then back to live with my mom and dad and two brothers. and low and behold, as I invited him to come on down and stay with me and my family for a week or whatever, and he did exactly that. We had a great time of it. After that, I became desparidido. In other words, I dove the boat, and have only recently surfaced. [ if you knew John well , then you know, that he would find that hilarious, and worthy of Saturday Night Live, or a gig at the comedy corner. the end of a good life. another one my favorite, Even You can be a Believer. I hope Johnny boy got that. I did. I was living with John and 14 other real nice hippie guys, no girls allowed at that house on Kapili Street. When anyone wanted weed, I would go out and get Thai Stick, and then the good stuff was Black Opium. I could get anything you wanted, I just had all those connections. the guys all had their outside girl friends, and they all would come to me, hey pete can you get some Black Opium, sure no worries mate, and then will you drive us around the Island while we all get stoned in your car together? sure. The loved me. I would take the craziest stuff, the same as them, and hold the universe all in my hands, not letting it go, and drove that car all around the island Stoned cold stoned, not in this world, but in the one above. They marveled at that. I always kept it all together. I am sorry for our loss. I have learned from everyone whom I love who passed on before me, there is never enough time to spend with a loved one. I lived next to John for awhile and bought a “stained-glass” cut-out from him. As I was deciding where to finally hang it again. I thought I’ll Google John and see how he’s doing…surprise, surprise. Thank you for posting the article and letting the rest of us know his fate. Inger, Thank you for touching base here, glad I was able to update you with the sad news about our friend. We all remember him fondly, with love and laughter. Yes, blessings to John, and to all who knew him. He was the world to me. For some reason, it says that i’ve already submitted the above. Perhaps I did a double tap. But, I must say,I loved him more than anything and anyone. Karin, to say that John was one-of-a-kind does not do him justice but all of us who knew and loved him are forever touched by his wit, humor and generosity of spirit. 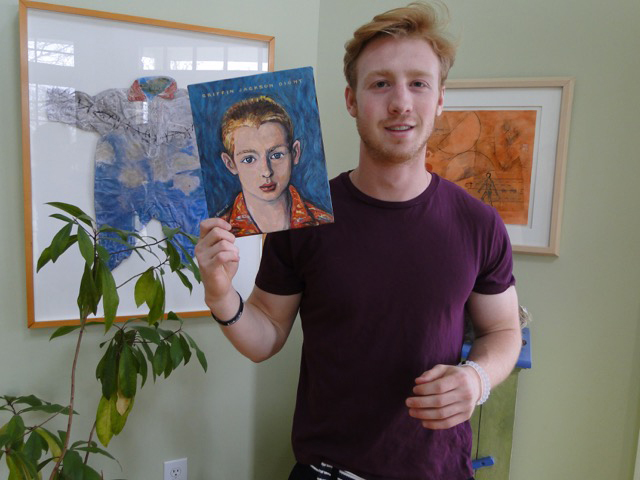 I have the two paintings that he did of our sons when they were young and think of him daily. Sending you blessings of peace and love.